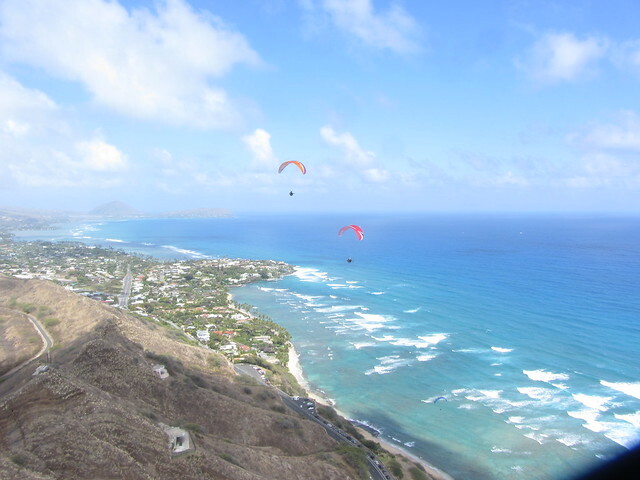 My first introduction to flying Diamond Head came long before I was a pilot, and it was actually pertaining to a select once-upon-a-time apparent hang glider that chose to soar those onshore winds. Gifts of Kona were the basis of the story: this was a connection between a Hawaiian spirit, with a passion for the view and the importance of place at the precipice of Diamond Head, and an unsuspecting Californian, a surfer who came to know and respect the particular form and shape of the mountain which formed the winds and the waves on which he rode. The article was in The Surfers Journal, quite a few years ago now, and was about a time long before me. As I have been flying for approximately five years, it must be at least seven years ago that I read this story. 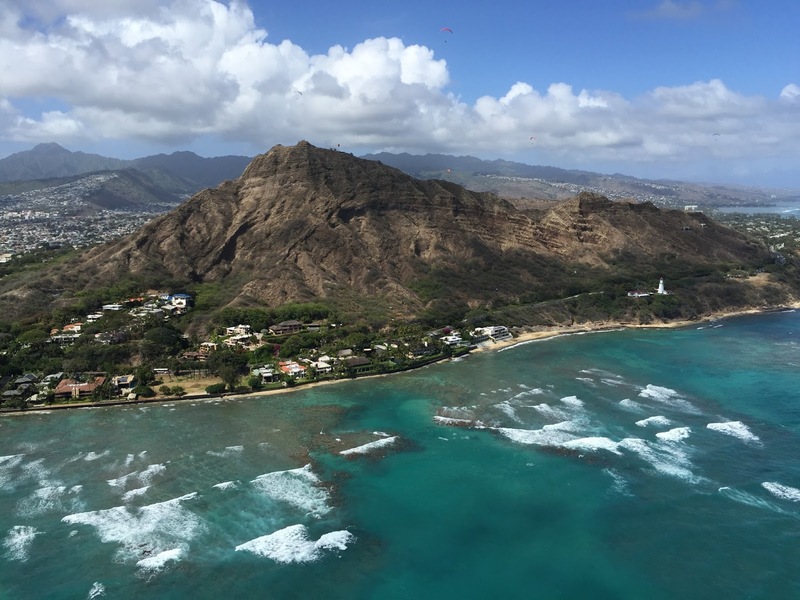 It created an indelible image of a period in time and a way of life in which limits were being raised, a time when Diamond Head would have been soared by one and one alone, and so spiritual levels were raised. I would have to say that today was one of those days, in a modern way, and though we did not have Dave Goto to grace us with his presence, we did have Leo and Nancy, and about twenty paraglider pilots. After beating Reaper to Diamond Head, and meeting with Motorhead, I thought that it was too west and not quite strong enough, so I decided to paddle out and surf till they made things look good, which did not take long. Many waves later, there were still only two aloft. As the morning progressed, I noticed that the winds were shifting more southerly, and the wave conditions were deteriorating, and that by all accounts it must be working despite the early flights to the beach I witnessed from the peaks of the waves. Just one more wave and then I was laying out my wing and longing to soar! Cycles were difficult, and clawing our way through the thermal block was mandatory. I had just watched Joey, Eddie, and Motorhead join Alex and Reaper above the ridge, and I was now waiting out Ike's attempts to break through the thermal block that made the ocean waves into beautiful spectacles all day long! I had visions of every flight and every experience that I have ever shared with this area, and today was just such a day, a day when the spirits were shouting to us from the summit of Diamond Head to find our way up, and stay aloft, and drift though a sea of souls as they passed by Diamond Head. The narrative of this story was an immersion, an osmosis function of Hawaii, and that the basis of becoming Hawaiianized meant releasing all of what you have to this sense of place; then and only then will we truly appreciate what we have in this place we call Oahu and begin to truly receive the gifts we are offered. 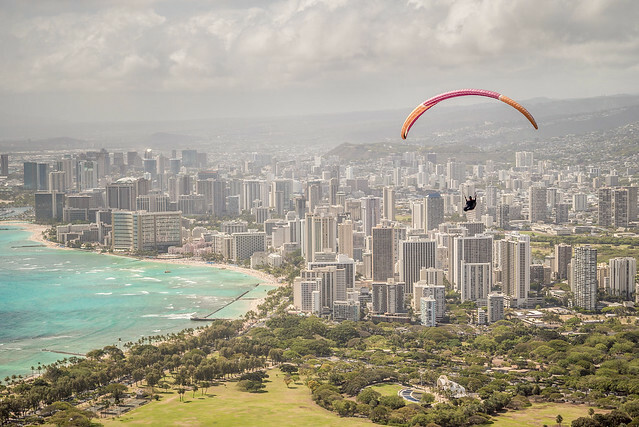 For many hours yesterday we soared the ridges of Diamond Head, and probably accumulated a total of fifty hours of flight, contributed by approximately twenty pilots of whom perhaps fifteen flew. Many had two flights or more, some upward of three hours, naturally! It is a day similar to this which we shared with many souls that were touched by our wings. This was a true Hawaiian immersion and a vicarious spectacle of the nylon heavens. Gaza, thanks so much for your very first contribution to our collection! I look forward to many more! I added a picture I took from out towards the buoy that shows many gliders soaring over the ridge and the waves. I'll add more pics and videos, from me and others, when I get a chance. It was one of the most amazingly perfect days out there I can remember since I started flying there sixteen years ago. I know we can't be picky, but I'm hoping for more like that! By the way, Dave Goto was actually very close by, at Rumfire Waikiki, and he called at the end of the day to ask why no one was in the air! I had to admit it had gotten too light for us to stay up. As you all know JJJ has met his demise and possibly it was a good thing, cause now we have another blogger. Thanks Gaza. I was surprised to see a story up and I too will send what pictures I got. Some of you that hopefully Alex can add in. Thanks to Paul MotorHead Kunzl for bringing a little flyable weather with him. What a great day, all day too. It didn't shut off on me like it did that last 2 days over at Makapuu. I even scored my first 2 top lands at Diamond Head. Biggest group we have had out in a while. Feel bad for all that didn't score this one cause it was awesome and we may have to live on this high for quite sometime forecast looking a little strong.....but what they know, we got Motorhead. I had a day at the beach with the family, I flew before in the, top landed, got to hang a bit with Leo and Nancy. I ran down to the beach, swam and had lunch with Kim on the beach. 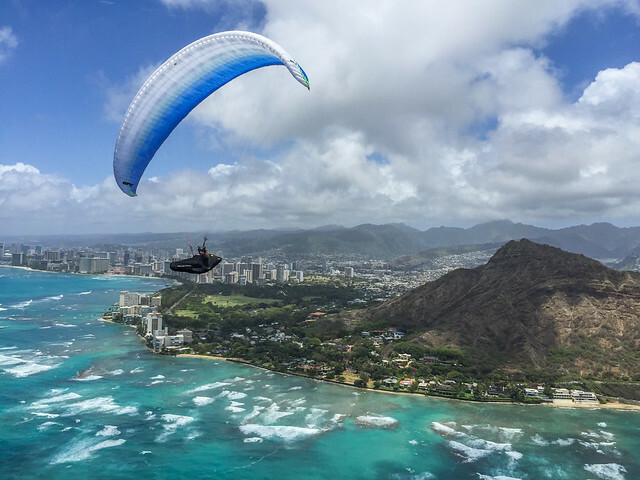 I ran back up and flew again, thought I would try something different, getting high and peeling off over Kahala knowing Kim was driving home that way. I connected the parks and golf course, thinking if I hooked into a workable thermal, I would drift back onto the Koolau, maybe head to Sandys. 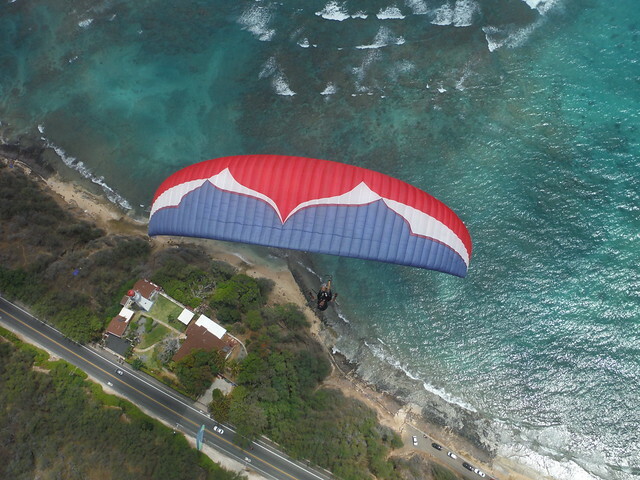 But all I got was a long floaty glide and landed at Waialae Iki soccer park, the closest park to my house. HPD stopped by because someone called, they were curious but left smiling. Kim picked me up a moment later. I am sure some good XC action is possible from DH, and I figured I should poke around looking for opportunities. What a great day, so many people; flyers, spectators, surfers, lots of fun. Just lots of fun.